This page explains how integration with Redmine is possible in Testcollab. To integrate Redmine with Test Collab, you have to fill your Redmine's Api key in issue manager settings page and you can leave the password field empty. 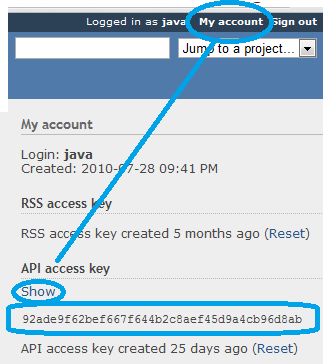 And, you must have "REST web services" enabled in Redmine to get API access key. This can be done by logging in as an administrator, and on Administration page, select Settings then Authentication, and check "Enable REST web service". 3. In Right column under API access key, click the show link. You also have an option of allowing the reported issue to be resolved automatically when the related test case passes by checking "Resolve reported issues when a failed test case is marked as passed". When you check this you will be prompted to provide the status code that Redmine uses for resolved issues, you need to enter the same for "Status code for resolved". project_id - You have to specify your project identifier here. Project Identifier is displayed on settings page of each project on information tab. It is a required Field. priority_id - You can define the priority of the issue here. Go to add issue page, and click on view source and you will see the value for priorities in similar format- <option value="1">Highest</option>, so our value for highest priority is 1. Similarly value for high is 2, for normal is 3 & for low is 4.
assigned_to_id - Here you can specify the value of the user to whom you want to assign all issues created from Test Collab. To obtain value for a user, click on view source, and you will see the value for assignee in similar format- <option value="10">Shriti Gupta</option>, so our value for user Shriti is 10. You can similarly find values for other users. status_id - You can set the status of your tickets from this field. To obtain value of a particular status, click on view source, and you will see the value for status in similar format- <option value="2">Reopened</option>, so our value for user reopened status is 2. 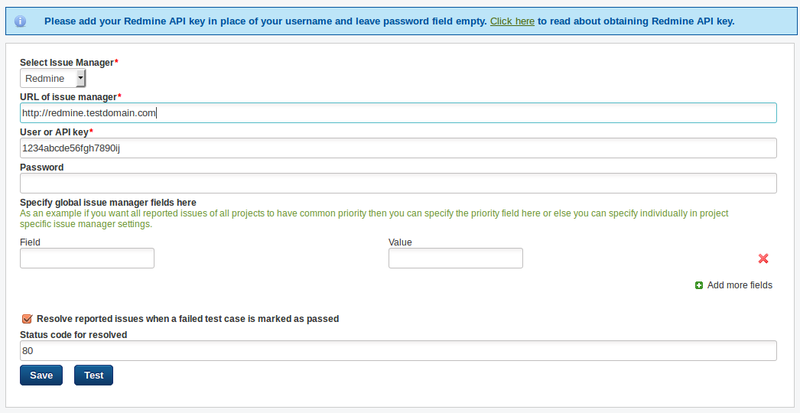 A completed project specific issue manager setting form for Redmine would look like this. You can click the Test button at bottom to make sure that Test Collab is able to create a sample bug in Redmine.